The 1800C Series regulator is a self-operated regulator used primarily in supplying gas for residential and commercial applications. 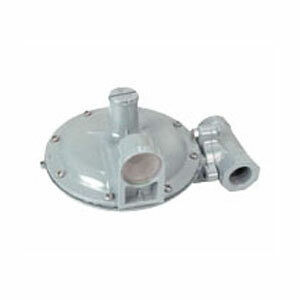 The 1800C Series Regulator may be used on natural, manufactured and LPG gases. Outlet pressures range from 3.5″ wc to psig (0.87 to 13.8 kPa). Capacity is 2500 Sft³/h (70.8 Sm³/h). Inlet pressures up to 150 psig (1050 kPa). Connection sizes ¾", 1″ and ¼" screwed NPT or BSP (standard). Available with full capacity internal relief, full capacity internal relief with overpressure shut-off, and full capacity internal relief with underpressure shut-off. Elevation orifice optional, which provides constant outlet pressure even when inlet pressure fluctuates greatly.